It’s really true. Time flies by so quickly when we are busy. I’ve had a full plate at work and at home lately, so it seemed just like a few days ago when I received the information on who my partner was for this month’s Taste & Create… and before I knew it, I am a few days away from the deadline! Fortunately, I already know what to do and I got the ingredients on hand, so all I really had to do was to make time to do it! Nike’s got it — just do it! For this month’s Taste & Create, I am partnered with Divya of Dil Se. Divya is of Indian (Asian) descent. She, like me, somehow found her way here to the U.S. She is based in California, which is a melting pot of different cultures from all over the world. No wonder why her blog reflects this mix of Indian as well as American/Western cuisine. It was easy for me to decide which one to do for the event. 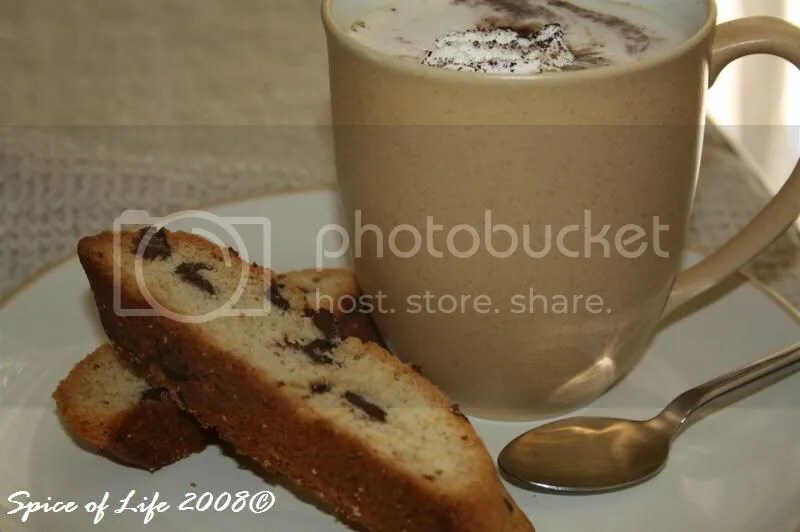 When I saw this in Divya’s blog and read the recipe, it made my mouth water. That’s a good sign, isn’t it? So, I thought no further… Ginger Cookies it is! Ginger is one of the most common spice for Asian cooking. The root has a strong, pungent flavor, while the dried/powdered ones have this sweet-spicy smell to it. A lot of Westerners do not really like it, or can’t stand much of it in a dish. The flavor is indeed very strong when one is not used to it. While I love ginger in savory dishes, I love it in sweets just as much. For instance, gingerbread. I love this holiday treat but I’ve never gotten around to try baking one from scratch. And I thought that this cookie might have the same taste as that of gingerbread, so I decided to do it. The recipe was easy and very simple. There was nothing more that I did to it; I simply thought of adding cyrstallized (candied) ginger on top for more flavor (and for looks too). And boy was I right. The cookies have the same flavor going on as gingerbread with the combined spices of cinnamon, ground cloves and the ginger in it. The ginger candy at the center gives you that nice sweet-spicy-chewy bite that’s just enough to give this cookie a little kick. Hmmmn…. the flavors of Christmas — they’re happy flavors! Next time maybe, I’d minced the candied ginger and mix it in the batter so there’ll be little specs of ginger goodness all throughout the cookie… what do you think? This recipe is definitely a keeper. I will for sure be making lots of these come Christmas holidays. Thanks, Divya for a great recipe. No wonder why you love these cookies! And I love ’em too. Maybe this will be Santa’s new favorite cookie too? In the Philippines, biscuit or “biskwit” means, soda crackers, or crunchy cookies. Thus, naturally, I grew up believing that biscuit means the same in the US or elsewhere in the world. But little did I know that though it is spelled the same, outside of the Philippines, the word doesn’t necessarily mean the same thing. So when a franchise of Texas Chicken opened in one of the big malls in Cebu, the city in central Philippines where I come from, I was surprised to read that the menu includes: “2 pcs chicken with biscuit“. Hmnn… I thought, “soda crackers with chicken? That’s interesting!”. So I made it a point to try, and when I did, I discovered that “biscuit” is actually a soft, round bread! And it tastes good too! That , ladies and gentlemen, was my first introduction of what “biscuit” in the western world is supposed to be. Now that I’m based in the US, I’ve also discovered that what rice is to us Filipinos, is bread to the Americans. Americans (and Europeans as well)are major bread eaters, and would eat bread with everything. That’s how Filipinos are too, with rice. Well, I may have eaten countless biscuits since moving to the U.S., but I can never forget that very first biscuit encounter that I had in Cebu. 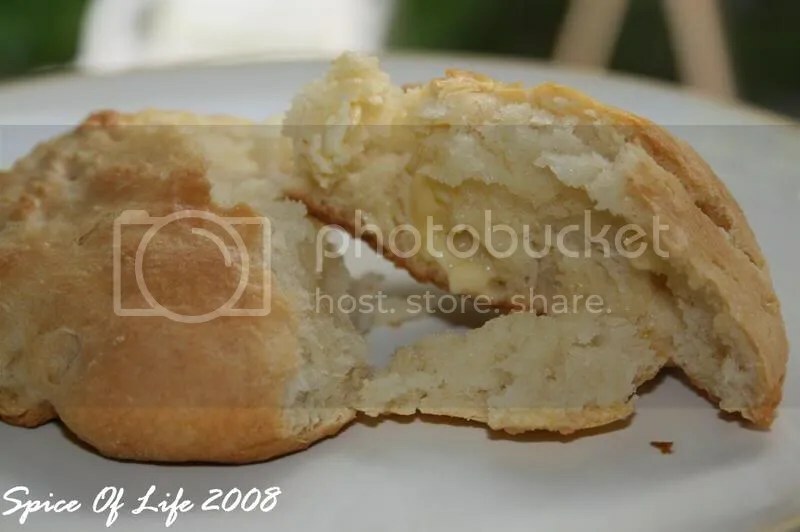 That biscuit had a little honey on top that made it a bit sweeter… And to this day, that’s how I like my biscuit… with a little honey and butter, reminiscent of my very first taste of this little yummy bread. The biscuit recipe I have here is simple. The buttermilk makes this traditional Southern specialty especially light and tender. The recipe is supposed to make 12 biscuits, but since I used a 5-in cookie cutter which is slightly bigger than the usual size, I only made 8 pcs. 2. In a large bowl, sift together flour, baking powder, salt and baking soda. 5. Pat the dough to 3/4-in thick. Using a biscuit cuttter or a glass dipped in flour, cut out biscuits. Place the biscuits, 2 in apart, on an ungreased baking sheet. Gather dough trimmings, pat to 3/4-in thick and cut out more biscuits. 5. Bake the biscuits 12-15 mins, or until golden brown. Serve hot. 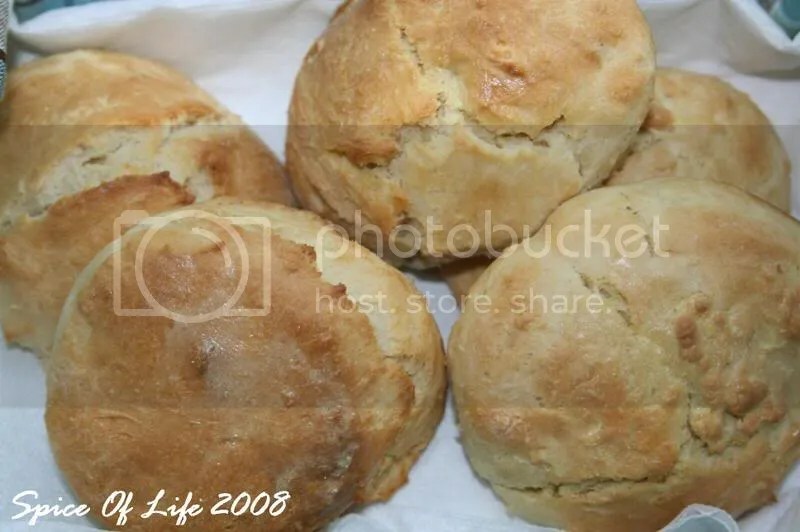 NOTE: For flaky biscuits, take care not to overhandle the dough. For less waste and speedier preparation, pat the dough into a square form, then cut into square shapes with a floured knife. I don’t consider myself a coffee drinker, per se. What I mean is, I’m not a heavy coffee drinker, somebody who consumes 10-12 cups a day. Uh-oh. I’m what you maybe call a light coffee drinker. One good cup a day, preferrably for breakfast, is enough for me. Why am I talking a about coffee? It’s because I have here something which is best enjoyed when accompanied with a good cup of coffee – regular or espresso. It could also be served as dessert, accompanied by a good italian wine, vin santo. 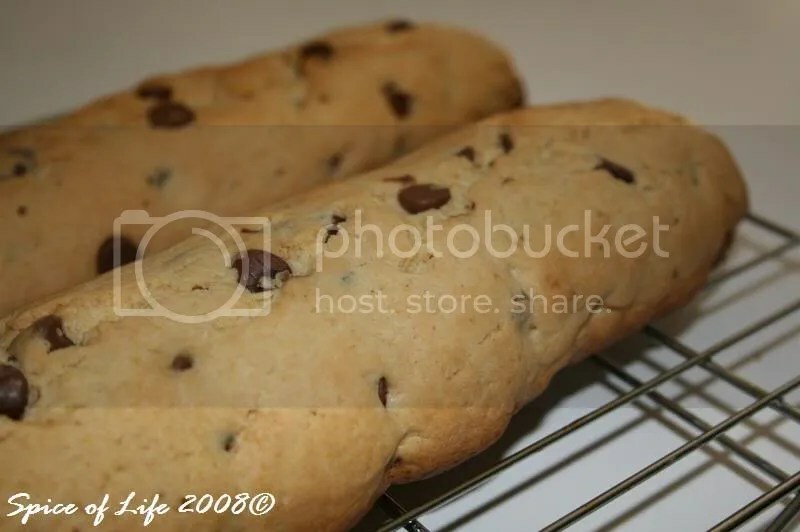 For those of you who don’t know, “biscotti” (singular, biscotto) is an Italian word meaning, twice baked. 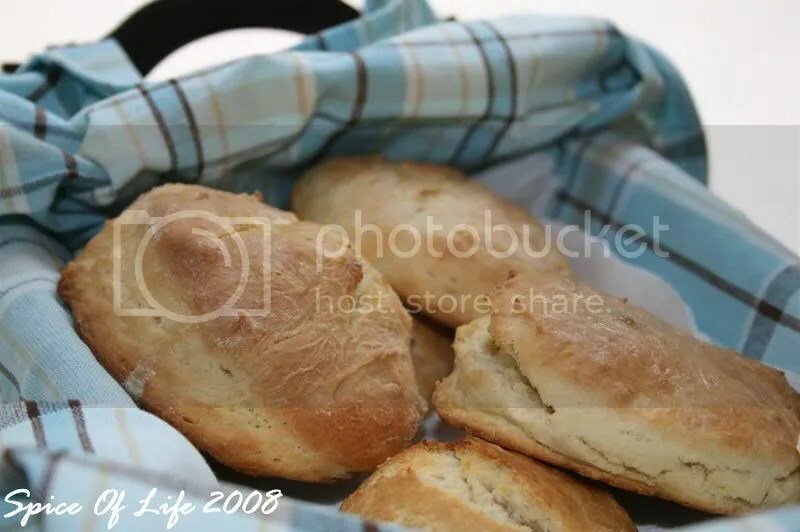 The Italians during the medieval period baked their biscuits twice so that they could be stored for long periods of time, which was especially important during journeys and wars. Now the transition from medieval Latin times to the modern period and how the biscuits then became cookies now, I have no idea. I will tell you about it when I’ll find the history. But for now, I am thankful to whoever came up with this ingineous idea. Being twice-baked, biscotti are crisp, and with their elongated shape, they are perfect for dunking in your coffee, or wine, whichever the case may be. 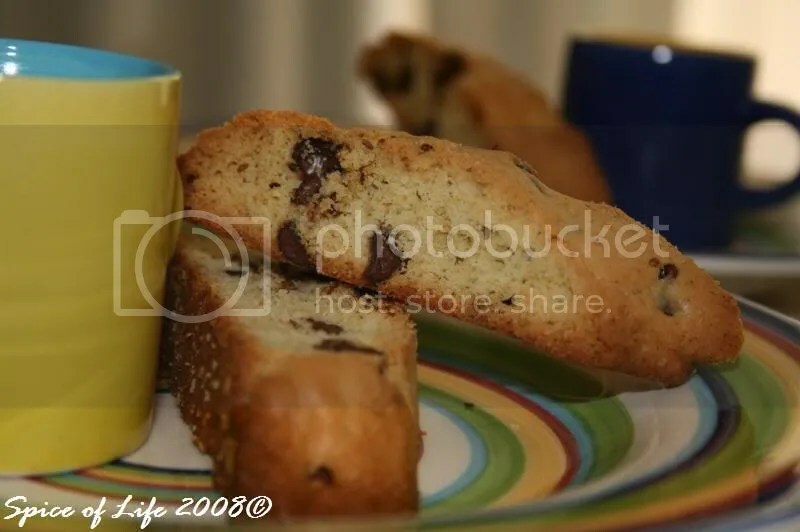 Biscotti is one of my favorite go-to sweets. It is simple to make – almost fool proof. 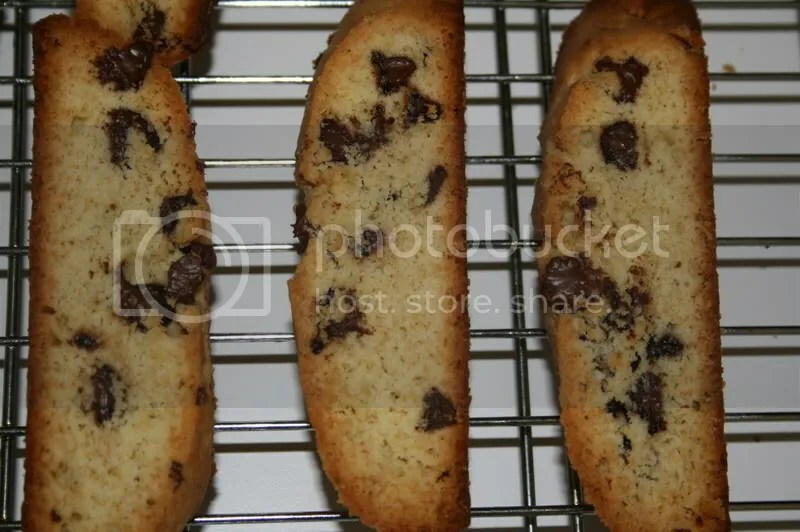 There are so many variations to the flavors of this cookie, but what I prefer the most is the traditional one — biscotti with chocolate and anise. And this is what I have here for you. Hope you try it. 2. Line a heavy large baking sheet with parchment paper. 3. Whisk the flour, baking powder, and salt in a medium bowl to blend. Using an electric mixer, beat the sugar and butter in a large bowl to blend. 4. Beat in the eggs 1 at a time. Add the flour mixture and beat just until blended. Add the ground anise seed and mix well. Stir in the chocolate chips. prepared baking sheet. Bake until light golden, about 30 minutes. Cool 30 minutes. 6. Place the log on the cutting board. Using a serrated knife, cut the log on a diagonal into 1/2- to 3/4-inch-thick slices. 7. Arrange the cookies cut side down on the baking sheet. Bake the cookies until pale golden, about 15 minutes. 8. Transfer the cookies to a rack and cool completely.